Kripalu Yoga style emphasizes meditation and breathwork, while encouraging inward focus through gentle movement. I recommend you move at your own pace, stay present with the breath and embody self-compassion. Trauma-informed yoga recognizes that people experience innumerable types of trauma in their lives physically, emotionally and spiritually. These experiences can leave us feeling vulnerable, and for that reason my goal is to help you feel safe in your body so that you can be empowered by the tools yoga has to offer. Classes are taught with careful attention to all practitioners. Plenty of support, options and modifications are offered throughout. All classes end with a mindful meditation. Suitable for all levels. Grab a partner, invite your friends & family. This opportunity is tailored to meet you where you are. 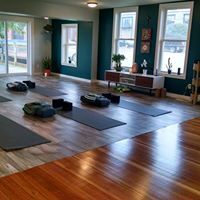 Enjoy 60-90 minutes of centering, grounding and exploring gentle yoga postures while allowing yourself to release judgement and build connection. You will be encouraged to breathe, feel and notice the compassion within.